It turns out that the ending moviegoers are going to see when they catch Glass this weekend isn't the ending that was originally intended. M. Night Shyamalan has been laying the groundwork for this movie for sometime, starting with Unbreakable in 2000, with things really heating up when 2017's Split turned out to be a surprise sequel of sorts to that movie. Now, Glass will conclude his long-in-the-works trilogy, but it's not going to conclude in the way he originally envisioned. The cast has been making the press rounds to promote Glass. Recently, Samuel L. Jackson spoke a bit about the movie's original ending. As it just so happens, when they started making the long-awaited sequel, it had a different ending that needed to be changed for reasons that have to do with the current state of the world. Here's what Jackson had to say about it. "There was a different ending when we first started this that kind of needed to be changed because of the way society is and what's going on in the world and what it would have looked like." That is frustratingly vague, but quite interesting. It's tough to really dig into this without having seen Glass with the ending that made the cut, but these comments are no less intriguing. What could that original ending possibly have touched on? Was it too political? Did it hit too close to home when it comes to gun violence? Would it somehow have been problematic with the #MeToo movement? All we can do is hopeless speculate, for the time being. In any event, it does appear as though the culmination of this trilogy has been altered to suit the times we live in. What we know for sure is that M. Night Shyamalan is closely associated with twist endings in his movies. In the case of Split, the movie stands almost entirely on its own. The twist comes in the closing moments when David Dunn (Bruce Willis) appears in a brief scene, but an important one that connected the movie to Unbreakable. 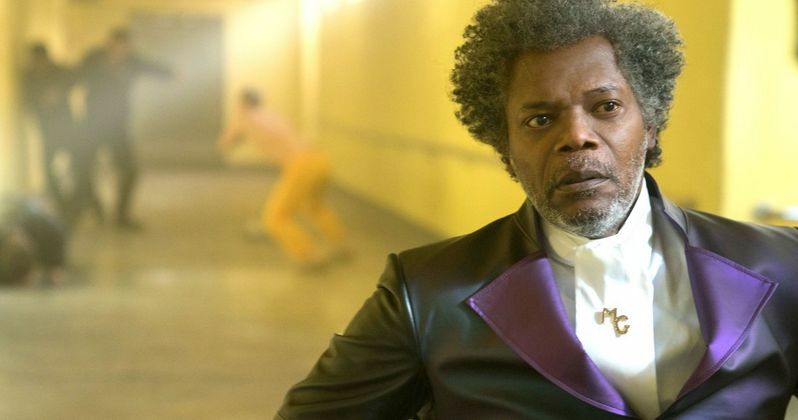 That helped to set up Glass, which will see Samuel L. Jackson return as Elijah Price, who teams up with Kevin Wendell Crumb, aka The Beast (James McAvoy) to take on David Dunn. Does this ending change mean that we lost out on a completely different Shyamalan twist? Hopefully, the director will talk a little bit more about that once the movie actually arrives in theaters. As it stands, critics who have screened Glass haven't been terribly kind to it, as the movie currently holds just a 38 percent approval rating on Rotten Tomatoes. Would the original ending have helped or hurt that situation? We'll probably never know. Though, based on Samuel L. Jackson's comments, it does sound like they at least avoided some potential controversy. Glass hits theaters on January 18. This news was first reported by Digital Spy.